All Writing Prompts.com - Writing prompts you can sink your teeth into. Creative Writing Prompts - Use the creative writing prompts and creative writing ideas to create stories, poems and other creative pieces from your imagination. Put your cursor on any of the 346 numbered prompts to see one. Education World has 180 quotes for you. That's one per school day! Consider using the list of quotations as writing prompts. Imagination Prompt Generator - Click to get a new prompt. 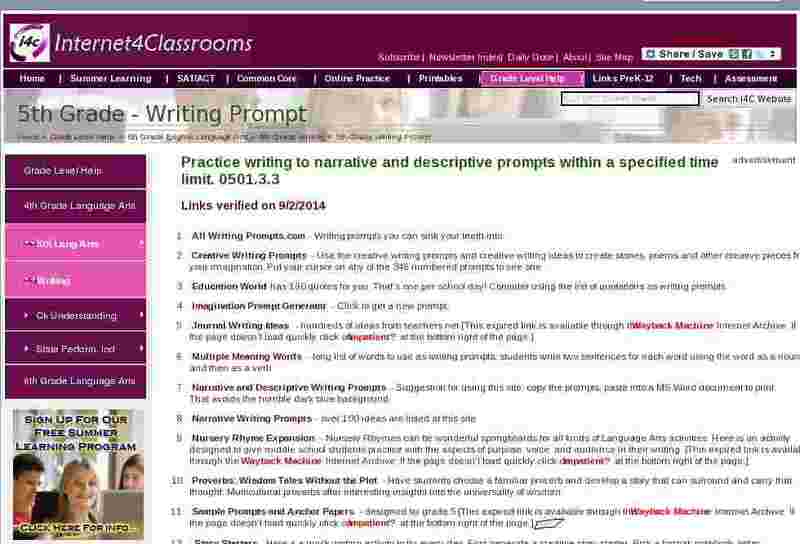 Narrative and Descriptive Writing Prompts - Suggestion for using this site: copy the prompts, paste into a MS Word document to print. That avoids the horrible dark blue background. Proverbs: Wisdom Tales Without the Plot - Have students choose a familiar proverb and develop a story that can surround and carry that thought. Multicultural proverbs offer interesting insights into the universality of wisdom.